Info "Hey, Mario, don't drop the ball! Har har." Pinball is one of 9-Volt's microgames in WarioWare: Twisted! It is set in the bonus area of the NES game Pinball. 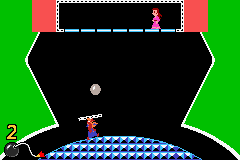 The object is to move Mario (holding a paddle) and keep the pinball from hitting the bottom of the screen. Meanwhile, Pauline is running across the top of the screen, as she did in the original game. Level 1: The paddle is rather large. Level 2: The paddle is a bit smaller. Level 3: The paddle is even smaller. This page was last edited on September 20, 2018, at 08:55.